VIZ Media delivers fresh ninja action to manga readers as it announces the digital debut of Naruto: The Seventh Hokage and the Scarlet Spring in today’s issue of Weekly Shonen Jump. The brand new, limited-run series by Naruto creator Masashi Kishimoto depicts a new generation of shinobi. After a short break, Naruto is back! And the story picks up right where the series finale left off. As the newest Hokage, Naruto’s face now adorns the mountain behind the village. The same one he used to paint on as a prank when he was an attention-seeking kid! After his legendary feats, Naruto has gained the respect of everyone in the ninja world…except his own son. Boruto is as bratty and stubborn as Naruto used to be! How will these two ever see eye-to-eye?! VIZ Media has announced that it will team up with Los Angeles-based film distribution company Eleven Arts to present U.S. anime fans and filmgoers nationwide with a very special opportunity to catch The Last: Naruto The Movie in a limited theatrical engagement happening in select U.S. cities beginning on February 20, 2015. Tickets go on sale starting in mid-January 2015. Additional ticket information and a complete list of theatre locations and screening dates will be available on Eleven Arts’s website at that time. The film will be presented with original Japanese dialogue with English subtitles. 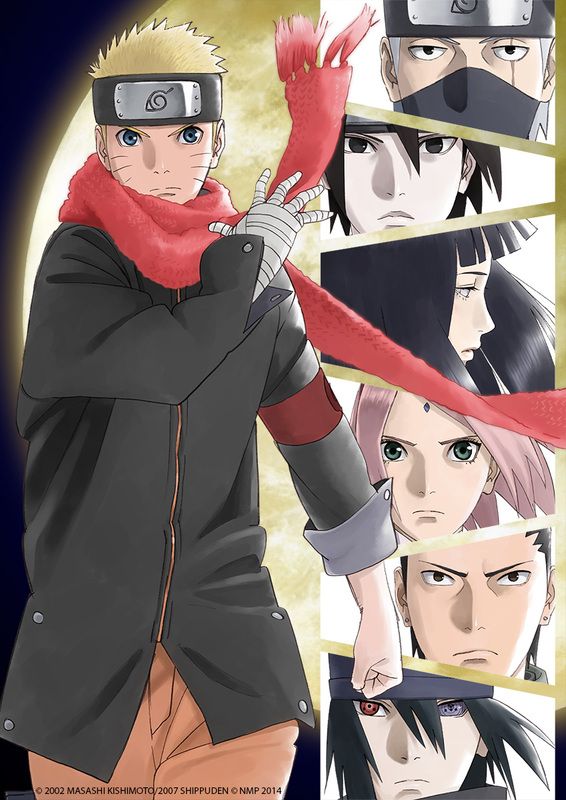 Attendees also will receive a special commemorative Naruto film poster (while supplies last). Additional cities and screenings may be added. VIZ Media is teaming with Gecco for a special 1/6 scale Naruto masterpiece statue of the world’s most popular ninja, clad in 4th Hokage coat version, to be offered exclusively at the VIZ Media booth (#2813) during the San Diego Comic-Con 2014. The convention takes place July 23rd-27th. In this limited edition version, Naruto Uzumaki is rendered in high quality full-color PVC, standing approximately 27cm tall and wearing the 4th Hokage’s famous coat. Crafted by skilled Gecco sculptor/painter Shin Tanabe with painting by Katsushige Akeyama, the intensity of Naruto’s expression has been carefully designed to show his fierce resolve to face enemies in order to protect his friends and save the world. The statue features a highly detailed costume capturing every wrinkle and texture, a true indicator of the exceptional craftsmanship of this masterpiece. The Gecco Naruto Uzumaki, 4th Hokage coat version, will carry an MSRP of $150.00 and will be available while supplies last. San Francisco, CA, October 14, 2011 – VIZ Media, the largest distributor and licensor of anime and manga in the North America, announces the countdown to the launch of WEEKLY SHONEN JUMP ALPHA (WEEKLY SJ ALPHA), a weekly serial anthology of some of the most popular manga series in the world: BAKUMAN｡, BLEACH, NARUTO, NURA: RISE OF THE YOKAI CLAN, ONE PIECE, and TORIKO. The first issue of WEEKLY SJ ALPHA goes on sale January 30, 2012, and will be available through VIZManga.com and the VIZ Manga apps for iPhone™, iPod™ touch and iPad™. Each new digital issue of WEEKLY SJ ALPHA brings manga fans in North America the latest chapters of their favorite series only two weeks after it debuts in Japan’s massively popular WEEKLY SHONEN JUMP Magazine. Currently, Japanese releases are often several months to years ahead of North American print titles; WEEKLY SJ ALPHA eliminates the delay in unprecedented fashion. WEEKLY SJ ALPHA will be made available through an annual membership that provides access to 48 weekly issues for 52 weeks for just $25.99. Single issues of WEEKLY SJ ALPHA can be read for a four-week rental from the time the reader purchases it for only $0.99. Each issue, once received on one device, can be read on all other enabled devices through the easy-to-use integrated VIZ Manga app and website. To prepare fans for the debut of WEEKLY SJ ALPHA, VIZ Media is also offering the SHONEN JUMP DIGITAL WARP, a limited collection of digital graphic novel speed-ups that will bring North American readers up-to-date with Japanese releases. In some cases, the digital speed-ups will jump ahead of the print releases in North America. The SHONEN JUMP DIGITAL WARP will begin with NARUTO Volume 53 (available now) and BLEACH Volume 49 (coming soon). As more fans migrate to the digital WEEKLY SJ ALPHA edition, VIZ Media plans to phase out the print edition of SHONEN JUMP Magazine. The popular, one-of-a-kind monthly magazine led the rapid growth of the manga market for much of the last decade and was VIZ Media’s flagship publication since it launched in 2003. The farewell April 2012 issue hits newsstands March 2012. The World’s Most Popular Ninja Returns In A Brand New Anime Feature Film And Faces Down A Dangerous Airborne Menace! San Francisco, CA, September 29, 2011 – VIZ Media, LLC (VIZ Media), the largest distributor and licensor of anime and manga in North America, is proud to announce the DVD and Blu-ray release of the latest NARUTO feature film on October 25th. NARUTO SHIPPUDEN THE MOVIE: BONDS will be the first Blu-ray release from the international anime franchise to hit North American shores, and is rated ‘T+’ for Older Teens and priced at $24.98 (Blu-ray) and $19.98 (DVD) in both the U.S. and Canada. NARUTO SHIPPUDEN THE MOVIE: BONDS is packed with dynamic action and visually stunning fight scenes, giving devoted fans and newcomers alike a chance to experience NARUTO SHIPPUDEN like never before! In the movie, a group of mysterious flying ninja have arrived from overseas to launch a sudden attack against the Hidden Leaf Village, leaving behind a wake of destruction. The group is revealed to be the “Sky Ninja” from the Land of Sky, a nation thought to have been destroyed by the Hidden Leaf Village long ago. To save their village, Naruto and his friends set out to stop this new threat. During the course of the mission, Naruto crosses paths with Sasuke, his friend who has parted ways from the Leaf Village.